This is more seasonal Science Fiction art, which I found over at the site, 70s Sci-Fi Art on Tumblr, at http://70sscifiart.tumblr.com/. 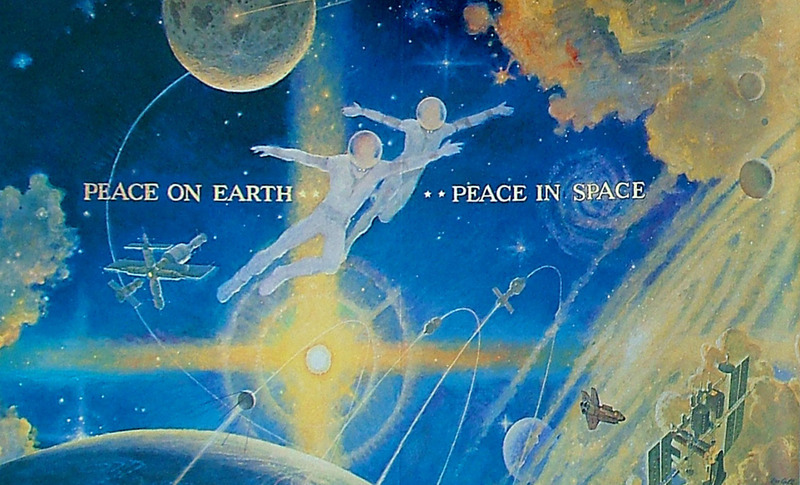 First a message of peace, from artist Robert McCall. 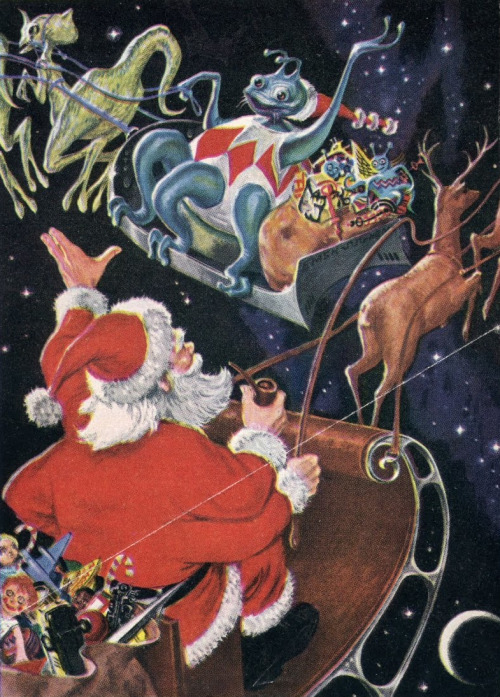 And two space Santas meeting, one of whom is very alien! It’s from a series of Christmas covers Ed Emshwiller drew for the American SF magazine, Galaxy, from 1951 to 1960. There are several more at the 70s Sci-Fi Art site. Christmas is the time of peace and goodwill. Unfortunately, our world is still riven by war, so this prayer from the Apostolic Constitutions of the early Christian church is tragically still relevant. Let us pray for the peace and happy settlement of the world, and of the holy churches; that the God of the whole world may afford us his everlasting peace, and such as may not be taken away from us; that he may preserve us in a full prosecution of such virtue as is according to godliness. Let us pray for our enemies, and those that hate us. Let us pray for those that persecute us for the name of the Lord, that the Lord may pacify their anger, and scatter their wrath against us. Save us, and raise us up, O God, by thy mercy. Let us rise up, and let us pray earnestly, and dedicate ourselves and one another to the living God, through His Christ. I wish all the readers of this blog, whether they’re Christians or not, a very happy, and peaceful Christmas. And may you also enjoy a happy and prosperous New Year (the present wretched government notwithstanding). I’ve put up a number of posts over the past few weeks reporting the Israeli’s prime minister, Binyamin Netanyahu, and his supporters in the Republican party in America have been trying to drive America to war against Iran. They have tried to undermine and discredit Obama’s peace deal with the Iranians limiting their nuclear programme. Before then, back in 2012, Netanyahu lied to the UN about supposed Iranian readiness to develop nukes. Even Mossad, the Israeli internal security service, the Shin Bet and his own generals denied that the Iranians had the nuclear capability he claimed. Needless to say, Netanyahu and his warmongering doesn’t speak for all Israelis, just as the Repugs don’t speak for every American. I thought I’d post the video below to show the other side of the situation, that there were Israelis who also want peace and friendly relations with the people of Iran. It shows a young Israeli guy walking through the streets of an Iranian city, before sitting down at a café and getting out a backgammon set. He is then discovered by an Iranian friend. They greet each other, and then sit down to play a game. I don’t speak Hebrew, but the blurb for it put up by the poster on Youtube states that it roughly reads that ‘In reality this is not yet possible. But it happens on the internet all the time’. I first saw it about two decades ago when it was broadcast here in Britain on Tarrant on TV. That was a late night show looking at sleaze and general weirdness on television around the world. It was mostly lurid, tabloid entertainment, but here and there it did include pieces that made a genuine moral point. One of these was this Israeli ad. The video’s message is exactly right. Apart from ISIS and the preachers of hatred and violence, the Net has also brought nations together in ways that their rulers don’t like and can’t allow. It’s why the Iranian government during the Green Revolution attempted to censor the internet. It’s why countries like Egypt and others in the Gulf are trying to hack into mobile phones, aided with software developed by Western companies like Nokia. Through the Net, people in widely separated countries, divided by deep historical and religious hatreds, can nevertheless meet each other in peace and friendship. Nation, can indeed, speak peace unto nation. And it’s got a rocking soundtrack by the tartan terror himself, Rod Stewrt. Going through a volume of medieval music, I found this hymn, Stella Celi, written by the English composer Cooke. It’s a prayer for peace to the Virgin Mary. It asks her to bring this about by combatting the malign astrological forces that are causing wars on Earth. It’s a medieval prayer, written in the fourteenth century at the height of the wars that then raged, that nevertheless speaks to us across the gulf of centuries. Our modern world is also torn by war and violence. Now I don’t believe in or wish to promote astrology. Nevertheless the Bible reminds us that we also strive against the invisible powers of the fallen angels.In that respect its message is both ageless and particularly contemporary. So, let us pray that our Lady and all the saints will join with us in asking her Son, to bring an end to these present wars and guide the nations in the ways of justice and peace. In one of his comments to my original blog post on the Soviet Persecution of the churches, Robert claimed that European peace was strongly linked to the growth of secularism and the decline of Christianity, stating ‘European peace is positively correlated with the spread of secularism and the decline of Christianity.’ This is an extremely debatable claim, as it seems to assume that the peace Western Europe, at least, has enjoyed since the end of the Second World War is the product of the growth of secularism, if not atheism, and that religion, and particularly Christianity, is somehow responsible for war and violence. This claim can be criticised on a number of points. Firstly, it’s an important philosophical point that correlation is not causation. One can suggest a number of factors that may have created greater social and political stability in Europe that could lead to a decline in religious belief and international peace in Europe as a whole, without atheism or secularism being the direct cause of either of peace or the political and social stability both nationally and internationally that created it. Western Europe, along with North America and Japan, is economically the most prosperous part of the world, despite economic stagnation and challenges from the rapidly expanding and developing economies of India and China. One of the classic causes of social and political instability is economic decline and hardship. A lack of jobs, and thus the means for people to support themselves and stave off starvation, can lead to political instability and violence as nations turn to radical ideologies to provide solutions to their economic and social problems. The Nazi party in Germany appealed to the electorate by promising work and bread on their election posters, and achieved their greatest successes at the ballot box after the catastrophic Wall Street Crash threw the global economy into chaos and millions throughout the world out of work. In such a political climate of economic deprivation and threat, radical parties like the National Socialists were able to make great electoral gains by promising radical solutions to the country’s economic and political problems, including the use of force, violence and brutality against those they claimed, both within Germany and internationally, were responsible for her problems. The result was the emergence of the Third Reich in 1932/3 , characterised by the imprisonment and murder of the regime’s political and religious opponents, as well as those who were considered a danger to it or its racist objectives because of their religion, ethnicity, sexual orientation or physical or mental disability. The Nazis attempted to create a new, stronger, more powerful Germany through the conquest of central and eastern Europe and the exploitation of its resources, which were considered to form the key to global power generally, while those nations and states at the periphery of this area, such as Britain, were considered to be in a process of eventual decline through lack of access to this area and its natural resources. The Russian Revolution and Italian Fascist imperialism were similarly strongly influenced by the lack of economic development and progress in these nations compared to the more economically developed and prosperous nations elsewhere in Europe. Lenin, for example, believed that Russia had been deliberately held back and exploited by the capitalists of the more developed nations. He therefore appealed to the Russian working class to support Communism and the Bolsheviks’ programme of economic and social development by destroying international capitalism’s hold over the nation with the slogan ‘Smash capitalism at the weakest link’. Although usually considered to be at the opposite end of the political spectrum to Communism, Italian Fascism also had its basis in revolutionary Socialism, though this was anarcho-syndicalism, rather than Marxism, and Mussolini’s regime similarly used arguments based in the ideology of the radical left to support its campaign of military expansion and annexation. The Fascists declared that Italy was a ‘proletarian nation’ lacking the economic development and prosperity of other countries like Britain and France, and so deserved the resources of an empire, such as both of those powers possessed, in order to take its place as leading modern nation. Thus the Fascist regime justified its invasion of North Africa, Abyssinia and Eritrea, as well as its annexation of Albania and parts of Greece in Europe as part of Mussolini’s campaign to create a new, Roman empire. The collapse of the former Soviet Union created massive economic and political dislocation in the former Soviet bloc, including widespread poverty in the former Soviet Union itself as the change to capitalism saw inefficient factories and concerns closed, throwing millions out of work, and pensions destroyed over night as the rouble became valueless. Observers of the contemporary Russian political scene, such as the British journalist Jonathan Dimbleby in the recent BBC TV series, Russia, have expressed grave concern about the increasingly authoritarian, anti-democratic nature of the regime and general political climate. Nevertheless, Russia remains a capitalist state open to outside investment, and a far more peaceful attitude to Western Europe at least than under the former Soviet Regime. Italian politics has been notoriously unstable, which has resulted in a process of political fragmentation in which a large number of small parties have emerged to compete for power, compared with the two and three party systems of North America and Western Europe. Governments have frequently fallen due to corruption, while the country has also been subject to terrorist atrocities by both the extreme Left and Right. Despite this, the Italian economy has developed considerably, so that while explicitly nationalist parties have emerged to play a major role in Italian politics, such as the Allianza Nazionale, which became a partner in Enrico Berlusconi’s coalition regime, Italian politics is still democratic and there is little popular demand for the rejection of democracy and the use of military force to increase Italy’s stature in the international community or develop her economy and society. Of course, nationalism has also always been one of the major causes of violence and war. Many of the wars in the 19th century were nationalist conflicts, such as the campaigns of Greece and the other Balkan nations to gain their freedom from the Ottoman Empire, and Poland and the other nations in central Europe to gain their independence from Germany, Russia and the Austro-Hungarian Empire. The independence of many of these central European nations, like Poland and the former Czechoslovakia, was finally achieved after the dissolution of the Austro-Hungarian empire and the redrawing of European national boundaries after the First World War. The borders of many of the central and eastern European nations were similarly revised at the end of the Second World War, as Germany ceded large parts of its territory, such as Pomerania and Silesia, to Poland. Despite this, the national boundaries have, with the serious exception of the former Yugoslavia, been stable, though there are still continuing national tensions in the Balkans and the possibility of further warfare there. Nevertheless, in western Europe at least the question of national territories appears to have been settled. Where there is an increasing demand for independence amongst some nations, such as Scotland and Wales in the United Kingdom, there’s the expectation that this can be gained through the democratic process at the ballot box, rather than through armed insurrection and conflict. Thus part of the reason for the fifty years of peace experienced by Europe after World War II is the lack of economic and nationalist motives for war amongst the various European nations. Indeed, the horrors of the War itself and the devastation it caused economically, socially and politically left Europe exhausted and acted to turn public opinion against war and the use of military force. Of course this does not mean that these nations became pacifists, or that they ceased to wage wars against their enemies. The British fought a series of wars against nationalist rebels, such as the Mau Mau in Kenya, and the French in their turn fought militant indepence movements such as those in Algeria. Nevertheless, after the carnage of two World Wars, the military did not have the same glamour it possessed during the heyday of High Victorian imperialism. Within Europe there was a strong emphasis on international co-operation and rapprochement as a deliberate attempt to prevent the horrors of the Second World War occurring over again. The division of Europe between the western and Soviet blocs also helped create peace in Europe. In the West, Britain and other European nations, with the exception of France, banded together with America and Canada to form NATO in order to protect themselves against the threat of invasion from the Soviet Bloc. In eastern Europe, the Communist nations formed a similar military alliance, the Warsaw pact, while the massive political control of these nations and their subordination to the Soviet Union effectively presented an economically and politically united bloc confronting the liberal, capitalist societies of the West, rather than each other. If there is an explicitly atheist cause for peace in this situation, it’s probably through the atheist nature of Communism and the Communist bloc’s suppression of freedom and independence in the member states, rather than through atheism necessarily making western Europeans less militaristic. There are numerous sociological and ideological reasons for the secularisation of Europe over the past century, many of which are outside the scope of this article. However, it’s possible that the increased prosperity and social stability in post-war Europe was partly responsible for the decline of organised religion in the continent. Material prosperity and social stablility undoubtedly helped to create an emphasis in European culture on the concerns of this world, rather than the other worldly focus of traditional religion. For many Europeans it could appear that it would be possible to find satisfaction and fulfillment on Earth through human rational social and technological developments and planning, without the assistance of the Almighty. Religion could be seen as irrelevant to more pressing earthly concerns, such as the pursuit of one’s own pleasure and interests. Furthermore, the carnage of the two World Wars also created a spiritual crisis in many Europeans. The fact that European civilisation had created the mechanised slaughter of millions, including the planned, industrial-scale genocide of the Holocaust and similar campaigns to eradicate other peoples and minority groups, such as Gypsies, Slavs, homosexuals and the disabled, during the Third Reich discredited traditional European culture in the eyes of many European intellectuals. The appearance of the Affluent Society in the 1960s produced a feeling of dissatisfaction with traditional European politics and society amongst young people, and particularly with the traditional ruling classes who were viewed as out of touch and obsolete. For many Europeans this rejection of traditional authority necessarily included the church, which was criticised because of the support parts of it had given Fascist regimes and because of its central place within traditional European culture and as the guardian and promoter of traditional European morality. This morality had been severely compromised and discredited by the horrors committed by Europeans in the Fascist regimes, and the moral authority of the European powers to govern their colonies in Africa and Asia was successfully challenged as these nations gained their independence. Away from the political sphere, the Churches’ traditional moral stance, particularly on sexuality, was criticised as repressive, if not actually oppressive. Prosperity and security helped encourage Europeans to seek to gratify their desires immediately on Earth, rather than adopt the moral restraint advocated by the Church, which was attacked as oppressive and hypocritical. Thus the material prosperity and social stability Europe achieved after the War helped to produce both the long period of peace and the increased secularisation experienced by its nations. While undoubtedly some of those who became atheists after the War did become active in various peace movements and initiatives, the main causes of European peace lay in these social and economic developments, rather than being directly produced by the growth of either atheism or secularism in Europe. Robert’s implied claim that European peace was produced by the growth of secularism further suffers from its assumption that religion, and specifically Christianity, is a major cause of war. Now clearly religious differences have resulted in tension between different faiths, tensions that have resulted in violence and armed conflict. In British politics the most obvious example of this was the sectarian conflict in Northern Ireland, though this could also be viewed as the result of centuries of conflict over Irish independence and its government by Britain, in which religion is one aspect of a larger question of national identity and political allegiance. Similarly, some religions do have an extremely martial character that has promoted warfare and armed conflict. In the ancient Norse religion, for example, men could only get into Valhalla, to feast and fight with the gods in preparation for the final combat with the forces of evil at the day of Ragnarok if they died in battle. Those who had the misfortune to die of natural causes instead went to the far less pleasant realm of Helheim, a cold and miserable place, though not a place of punishment and torment like the Christian Hell. One ancient Viking king was, however, so terrified of the prospect of going to Helheim through dying in bed that, as an old man, he and his elderly retainers deliberately fought a battle with the specific intention of being killed so that they could enter Valhalla. Thus ancient Norse paganism reflected and promoted the martial, warrior ethos of Viking society and its consequent positive promotion of violence and warfare. Indeed, some Christian denominations, such as the Amish and the Quakers actively reject violence. William Penn, the great Quaker writer and founder of Pennsylvania, in his pamphlet arguing for religious toleration, A Perswasive to Moderation to Church Dissenters, in Prudence and Conscience, noted the constitutional arrangements granting freedom of conscience and worship in various European states to demand that Nonconformists receive similar toleration in England. 4 Rather than use warfare to settle their disputes, Penn instead urged that European states should instead solely use diplomacy. He thus proposed a plan for establishing European peace through the creation of an international parliament of European states that would meet annually to discuss and resolve disputes between the member states without resorting to military force. 5 In many ways Penn’s idea is a remarkable precursor of the contemporary European Union, and similar international bodies such as the United Nations. Despite their aims of promoting peace and international harmony, the EU and UN have been the subjects of suspicion and criticism because of the threat they represent to national sovereignty and the national traditions of civil liberty in various member states. Critics of the EU, for example, have attacked its lack of democratic accountability and the financial corruption in some of its institutions, as well as its bureaucracy, inefficiency and bizarre official policies that can place some states at a disadvantage and leave them resentful of the benefits granted other, sometimes more powerful states. The 19th century system of international diplomacy catastrophically failed to preserve European peace in 1914, and the following decades saw the rise of aggressively militaristic, Fascist regimes that utterly rejected the 19th century goal of preserving and promoting peace. Nevertheless, despite its failure the attempts of contemporary European nations to maintain peace through diplomatic negotiation and alliances is clearly partly derived and developed from these 19th century attempts to provide a diplomatic solution for international disputes, rather than the use of military force. These attempts to create the diplomatic methods to prevent international conflict were made when Europe was far more religious than it is at present and by politicians who mostly, though not exclusively, shared the concerns of general European society to preserve and maintain religion. It could therefore be considered that the peace currently enjoyed by contemporary, secular European society was founded by 19th century people of faith. let him seek peace and ensue it’ 17. Thus while the Bible does not necessarily reject warfare, it does command that Christians attempt to live in peace with their fellows and condemns violent behaviour. The Bible’s concern and encouragement of peace as a part of Christian morality directly contradicts Robert’s assumption that Christianity must somehow, by its very nature, promote violence and warfare, and that European society has therefore become more peaceful through its decline. Thus while the long period of European peace in the 20th century has also been a period of decline in the Christian faith, or its observance, neither secularism or atheism is the cause of this peace, as Robert’s comment implies. Rather the immediate causes of European peace have been stable borders, produced by the emergence of the nation-state in the 19th century, and the deliberate policy of European governments to settle international disputes by diplomacy rather than military force. This policy became a necessity after the carnage and devastation of the Second World War, and the threat of war with the Soviet bloc after the establishment of the Iron Curtain. However, European governments and statesmen had preferred to solve their disputes through negotiation rather than force, though certainly not to exclude warfare, since the middle of the second decade of the 19th century. The system of international alliances and organisations that emerged after World War II with the deliberate intention of promoting international peace and curbing the military aggression or the territorial ambitions of the individual member states can be viewed as a development of 19th century great power diplomacy with its preference for negotiation. There is a major difference between the two diplomatic systems, however in that the architects of the ‘Concert of Europe’ believed strongly in national sovereignty and would have rejected the threat posed to it by supranational organisations like the EU. Nevertheless, even the EU has its predecessors in the proposal of Christian statesmen and theologians, such as William Penn, for a common European parliament of member states to maintain European peace and harmony. Europeans had ceased to wage war purely for religious reasons after the 17th century. The main cause of European warfare in the succeeding centuries was nationalism, of which religion was largely just one aspect. The system of great power diplomacy and alliances that constituted the Concert System, although far less radical than Penn’s plan for a common European parliament, was nevertheless established by statesmen and diplomats who generally viewed religion as essential to their nations’ wellbeing, and wished to preserve it as a vital part of their nations’ security. The preservation and maintenance of established religion from attack from political radicalism was therefore one of the major purposes in the attempts to establish and preserve European peace after the defeat of Napoleon. Furthermore, while Christians have committed horrific atrocities in terrible religious wars, such as during the Crusades and the Wars of Religion, Christianity has also viewed the Almighty as a God of peace. Christian morality required peaceful, non-violent personal conduct, particularly as stated by St. Paul and St. Peter. A number of Christian sects, denominations and individuals have been determined pacifists. While these have only been a minority, Christianity as a whole has attempted to place moral limits on warfare and its conduct through the development of theories of the Just War, and Christians have continued to pray for peace in the world since the Early Church. While undoubtedly the various peace movements and initiatives that appeared in the 20th century were by no means confined to people of faith, nevertheless they have also included Christian clergy and laypeople. The peace Europe has enjoyed for the last half-century is thus partly the product of the attempts of Christians over the centuries to limit war and promote peace. It may be considered that the success of European governments and diplomats in establishing a largely peaceful, stable Europe may be one of the causes of European secularisation. International stability within Europe, as well as increased material prosperity and rising standards of living have led Europeans to adopt a far more this-worldly attitude to life, often to the exclusion of traditional other worldly religion. Thus national prosperity and international peace, as well as ideological challenges from secular philosophies, may have contributed to secularisation and the attitude amongst some Europeans that religion, or religious observance, is unnecessary. It’s a very flawed attitude. The great totalitarianisms of the Left and Right that emerged in the 20th century did so partly as a rejection of Christianity, and traditional Christian morality. Fascism in particular celebrated warfare for its own sake, in direct contradiction to Christian theology and morality. In their attempts to impose their own ideas of the perfect society on their subject peoples, these regimes murdered millions. Terrible atrocities have been committed by Christians in the name of their religion, yet European attempts to create a genuine, just peace owe much to Christianity. The horrors committed by the extreme Left and Right during the 20th century show how peace too can suffer once the traditional moral views supporting it, based on Christianity, have been rejected. 1. St. Augustine, cited in Vincent Carroll and David Shiflett, Christianity on Trial: Arguments against Anti-Religious Bigotry (Encounter Books, New York 2002), p. 90. 2. Carroll and Shiflett, Christianity on Trial, pp. 90-1. 3. David Martin, Does Christianity Cause War? (Oxford, Clarendon Press 1997), cited in Carroll and Shiflett, Christianity on Trial, p. 95. 4. ‘A Perswasive to Moderation to Church-Dissenters, in Prudence and Conscience: Humbly Submitted to the KING and His Great Council’ in William Penn, ed. Edwin B. Bonner, The Peace of Europe, the Fruits of Solitude and Other Writings (London, J.M. Dent 1993), pp. 187-223. 5. ‘An Essay towards the Present and Future Peace of Europe, by the Establishment of an European DYET, PARLIAMENT, or Estates’, in Penn, ed. Bonner, The Peace of Europe, pp. 5-22. 6. Harry Hearder, Europe in the Nineteenth Century 1830-1880, Second Edition (London, Longman 1988), p. 154. 7. Hearder, Europe in the Nineteenth Century, p. 153. 8. Esmond Wright, ed., History of the World: The Last Five Hundred Years (Middlesex, Hamlyn 1984), p. 406. 9. Wright, ed., History of the World, p. 386. 10. Hearder, Europe in the Nineteenth Century, p. 155. 11. Hearder, Europe in the Nineteenth Century, pp. 155-6. 12. Hearder, Europe in the Nineteenth Century, p. 156. 13. Hearder, Europe in the Nineteenth Century, p. 156. 14. ‘Collins, Lewis John’, in The New Illustrated Everyman’s Encyclopedia, vol. 1 (London, J.M. Dent and Sons 1985), p. 370. 15. ‘Charles Raven’ in Geoffrey Rowell, Kenneth Stevenson and Rowan Williams, eds., Love’s Redeeming Work: The Anglican Quest for Holiness (Oxford, Oxford University Press 2001), p. 612; Charles Raven, ‘The Religious Basis of Pacifism’, in Rowell, Stevenson and Williams, eds., Love’s Redeeming Work, p. 613. 16. F. Forrester Church and Terrence J. Mulry, The MacMillan Book of Earliest Christian Prayers (New York, Collier Books 1988), p. 61. 17. 1 Peter 3:11 and 1 Peter 3:10 in the Holy Bible, King James Version (London, Collins), p. 242. 18. Hebrews 12: 14, in the Holy Bible, King James Version, p. 235.